We’ve been asked to write the murder mystery evening for the International Agatha Christie Festival which is celebrating the 125th year of the best selling crime author! It’s not our first custom request, and it certainly won’t be our last, but it’s definitely the most exciting booking this year, and quite an honour. The Agatha Christie Festival website is now up and live, and there’s lots going on all week, so if anyone fancied a trip to the Devon Riviera in September, you better get your skates on as it’s an incredibly popular week and attracts a lot of International visitors. The booking was only confirmed last week, and the writing process has just started out, with some questions and some ideas being thrashed around as I type. We have a “brief” to work to, but we still need to establish the parameters. Artistic license… yes or no! Tickets are now on sale through the festival website, and what I can tell you is that the event will be one of our most popular styles of murder mystery – the multi-room style. 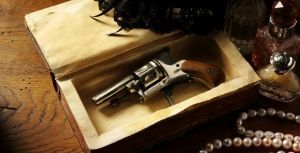 Where guests can fully immerse themselves into the role of detectives, handling clues and interrogating witnesses. The next few months are going to be incredibly busy in the office as, as well as the Agatha Christie Festival, we have another three new murder mystery event scripts to write before Christmas 2015! All fingers to the keyboards!